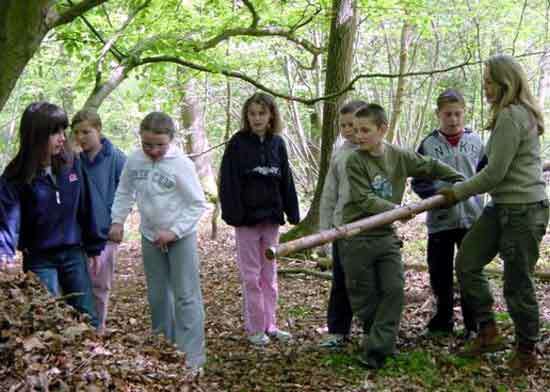 These confidence building programmes cover a number of valuable hands-on bushcraft skills that teach life skills and nature awareness to stimulate the imagination and provides a great experience of the countryside. Events are held in beautiful woodlands near Canterbury or at a location near you, if you have suitable woodland. We can even design the day to fit in with a project that your class or group may be covering. Here are some of the activities that can be included in your event. Typically we can fit in three activities within a single day. Debris and Lean-to shelters are made with standing dead wood and debris from the woodland. This activity gives young people hands-on experience of constructing shelters without tools. Building from scratch provides them with new skills, knowledge, and a great sense of accomplishment. Fire is an essential element in any survival situation. Your group will learn the correct way to find dry standing dead wood and construct a tepee fire. We will provide step by step instructions on the use of a fire steel and how to blow a tinder bundle into flames. We also demonstrate the use and preparation of char cloth. As part of this activity we will give instruction on health and safety of fire, the importance of following these instructions will be made clear. Many people associate the use of the Bow Drill to create fire with survival more than anything else. This is a challenging task that requires patience and perseverance in order to create a hot ember, then placing that in a tinder bundle and blowing it into flames. This is an activity that would take up a large part of any day, however we have a very high success rate and its an exercise that can be a very rewarding experience. An activity to heighten awareness of the environment and our senses, it involves moving through trees and undergrowth whilst blindfolded. The sound of a drum guides your path. People are often very surprised by how much they gain from this experience. We will teach your group about animal behavior, movement and tracks. During various exercises youths learn how to track and find animals they normally miss. We provide exercises identifying animal tracks and movement. Your party will go on to discover how to move to get closer to wild life without scaring anything away. Plant fibres from many sources can be made into string or cordage. We will show you all how to prepare various plants and everyone will be able to create their own cordage. This is a surprisingly therapeutic skill and requires following detailed instructions but, once mastered, can become “Quite addictive” as many have remarked. This is a very popular activity. All our activities are risk assessed and the assessments are available upon request. Natural Pathways has £5million insurance liability cover. For further information and prices, or to book an event please contact us. Just an email to say thank you for a really inspirational an ..